Aaron Shust has released his latest album This is What We Believe, produced by Ed Cash (Chris Tomlin, Leeland, Chris August). This ten track album is Aaron's fourth full length studio album, following his 2009 album Take Over. 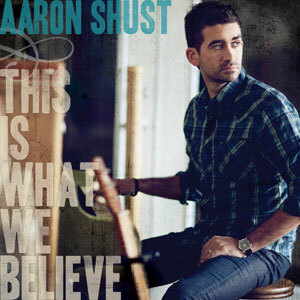 Read More Aaron Shust has released his latest album This is What We Believe, produced by Ed Cash (Chris Tomlin, Leeland, Chris August). This ten track album is Aaron's fourth full length studio album, following his 2009 album Take Over. The production on this album is as good as anything else released this year, but there are two real standout parts to this album. Firstly, what drew me into the album is Aaron's vocals. His clean voice has a really rich tone to it, and throughout the album he differs his vocal to fit the songs, making it even more interesting to listen to. Secondly, even though the style of the album might be a style that a lot of US male solo artists create, the melody notes of the songs aren't obvious, which keeps the listener interested in the worshipful lyrics that Aaron Shust is declaring to God. The album opens with two great rock/pop friendly songs, the amazing My Hope Is In You and This Is What We Believe, both great songs. But for me the songs Your Majesty and Sing Of My Redeemer are the two strong standout moments of the album. This is where we see Aaron not just being content with good songs, but taking the songwriting to another level. God So Loved The World starts off with a haunting piano just playing one or two notes, until the piano fills out into more chords. The song is based around the verses in the Bible from John 3:16 and is a simple reminder of what God has done for us, with the simple repeated lyric of "God so loved the world. Making an appearance on Wondrous Love is the very talented Kari Jobe, who adds her sweet and soft vocals to this stunning song, singing with Aaron "What wondrous love is this... You would lay down Your life for my soul". The more this album goes on, the stronger the album gets. One song that I haven't mentioned is the incredible Never Been A Greater Love, it's just one of those songs that words can't describe. This album is full of praise and worshipful lyrics, every song is declaring the majesty of God. The album grew on me and is definitely worth joining with Aaron in singing "He is our firm foundation, and our hope has been secured".